Despite being one of the oldest products available, the leather shoe is a surprisingly complicated process. Following all of these steps while staying true to our Fair Trade principles made things even more complex, so we wanted to show you just how it’s done! Here’s a quick video overview of the entire process, check out each step in more detail below! 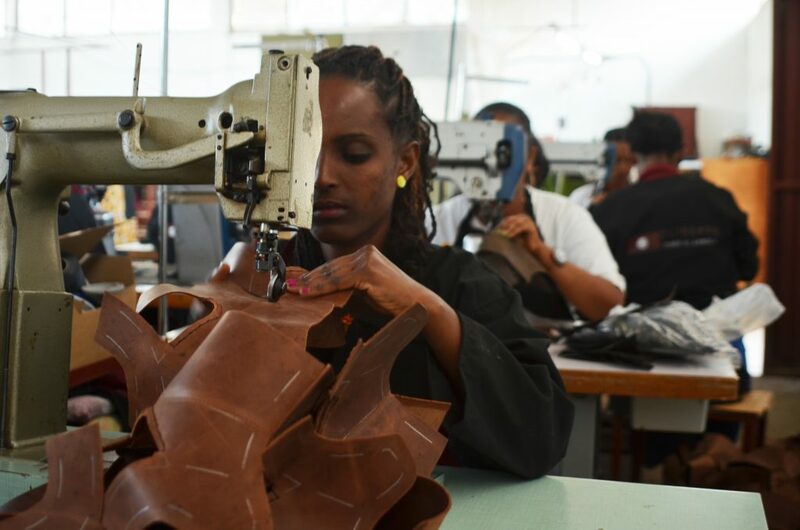 We start on the drawing board by taking inspiration from Ethiopia’s rich history of creating leather footwear and combining that with style elements from some of the most iconic shoe styles of all time. 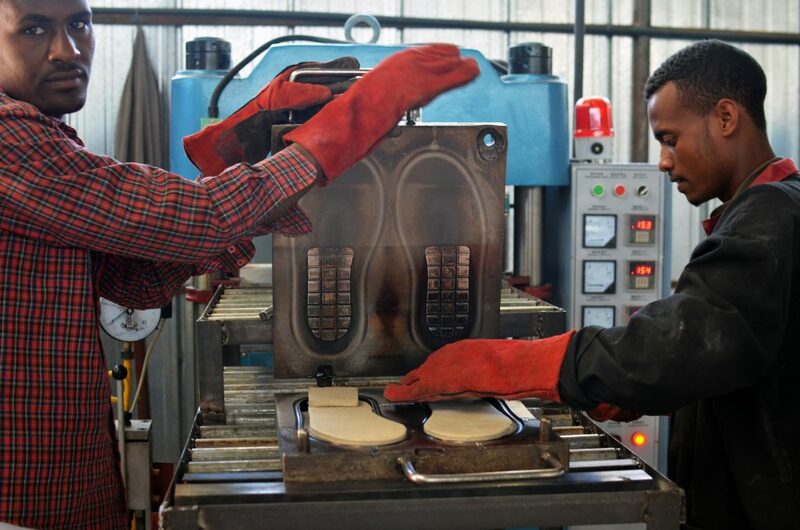 At this stage, we take our rubber base sourced from across the African continent and process it into one of our numerous sole-styles, including our famous Ethiopian Map Sole. 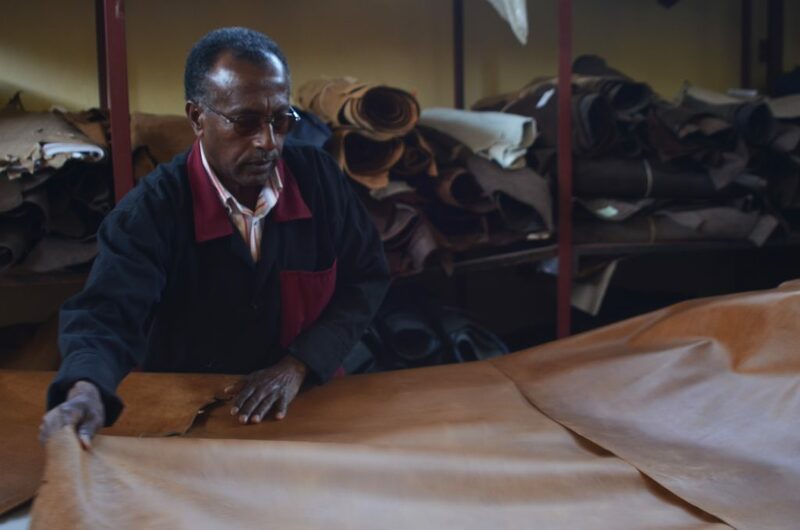 We source as much leather as possible from the Hafde Leather Tannery, which is one of the most environmentally friendly tanneries on Earth. 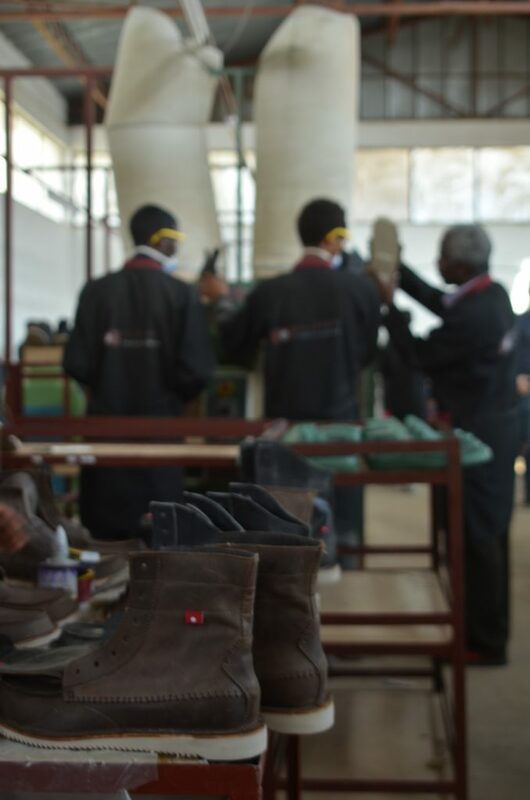 After selection, each hide is cut to minimize leather waste and form the building blocks of our shoes. Each individual piece of leather is marked to designate where the stitching and hole-punching will be done by hand. The leather is flattened on its edges at this stage to give a polished finish. The first stages of construction are completed by making each major stitch by a skilled hand. At this stage, each lace hole is hand-punched to ensure quality control and proper alignment. For the structural stitches, sewing machines are used to speed up a tedious process. The first applications of glue are made at this stage, to ensure a seamless bonding of each leather piece in conjunction with the stitching. Once the shoe starts taking form, we get really excited and stitch in our label to show how proud we are of even a half – completed shoe. The final holes are punched in at this stage to complete the lace section, depending on the model of shoe. More fine-tuned stitching is done now to create a more visually stunning final product. These new stitched sections get another generous application of glue to ensure a tight and long-lasting bond. The final round of machine stitching is completed as the shoe approaches its final form. At this point, the shoe’s leather upper is attached to one of our “lasts”, which help the shoe take its unique shape, and ensures that each shoe will properly fit according to its size. We now cut out the shoe’s mid-sole, which will give each shoe its comfort and shock absorption. The mid-sole is now sanded slightly to provide a textured surface which helps it bind with the upper and the main sole with glue, bringing the two main parts of a shoe together as one. 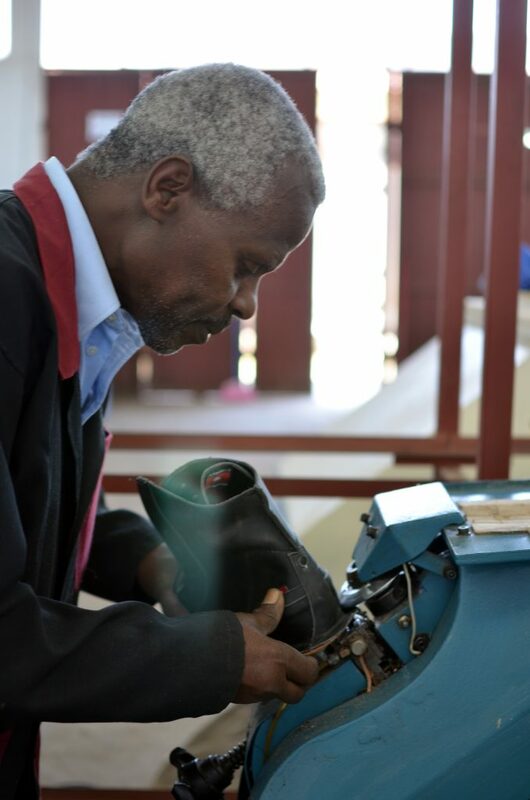 We use a generous amount of glue here to ensure the shoe comes together properly to form a long-lasting product. Each piece of the puzzle is now clamped together and left to cure to ensure a reliable fit. The excess leather is now trimmed off the outside of the shoe for a cleaner look and feel. The first round of glue is now oven-dried for a faster set. The bottom half of the mid-sole is now covered in glue to accept the sole. The sole is covered in glue as well to ensure the best bond possible. The two parts are finally pressed together using a hydraulic vice, to ensure a tight uniform seal. The nails securing the shoe to its last are removed at this stage. The sole is trimmed to make a perfect match with the leather upper. We sand the outside of the sole now for the perfect texture and consistency to make a polished product. The last is finally removed, leaving the shoe the perfect size and shape. We make all our finishing touches to the leather for the best aesthetic appearance. Our signature Map of Ethiopia insole is inserted for comfort and branding. The laces are tied, and our shoe is complete!